Two more EXCLUSIVE interviews coming soon! I’m very pleased to announce that I’ve just scored two more great exclusive interviews for www.howtowingameshows.com! The first is with Peter Berner. Pete is one of Australia’s most successful and best loved comedians with a career that spans thousands of gigs over the past 25 years. He’s a Comedy Festival regular, a much sought-after corporate entertainer and host of a number of his own TV shows. 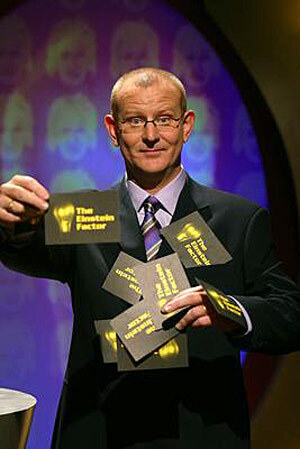 But perhaps most pertinently for us, From 2004 to 2009, Peter hosted The Einstein Factor on ABC TV. Over 6 years and 244 episodes, this original quiz show challenged contestants on their general knowledge, their own specialized subjects (which, over the course of the series, ranged from “The TV series Family Guy, seasons 1 – 4″ to “Five Good Roman Emperors”) and also asked them to match their wits with the show’s ‘Brains Trust’ – an ever-changing panel of academics, quiz show champs and celebrities*. Peter has very kindly agreed to be interviewed about his time on the show exclusively for www.howtowingameshows.com, and so I’ll be asking him all about the show, from his perspective as its host. Over the 6 years of the show, he quizzed over 600 contestants, so he was in a unique position to observe their habits, their foibles, their successes and their failures… And what separates the winners from the also-rans. It promises to be a wide ranging and very entertaining discussion (Pete’s one of the funniest people I’ve ever met), but the door is still open for you to add any questions you may have for him…. So if you had the opportunity to quiz a quizmaster with that kind of experience, who’s presided over that many episodes, what would you ask him? Any and all questions considered, but get in quick – I’ll be chatting to Pete very soon! Oh, I’ve just realized I haven’t mentioned the second exclusive interview. Well, let’s just say I’ll be having a chat witha kindred spirit – an Australian who has also had the experience of winning two game shows. One of them was in the ‘Australia’s Brainiest‘ franchise, and the other was a special series of our old favourite Temptation! And that’s where I’ll leave that… for now. Intriguing, yes? But in the meantime, send any questions you may have for Pete through to me, at stephen@howtowingameshows.com, and to read the finished product, be sure to keep checking back here at www.howtowingameshows.com ! *Full disclosure: I appeared on the show, as part of the ‘Brains Trust’, on some 17 occasions. This entry was posted in Interviews, Strategy, Tactics, Updates by Stephen. Bookmark the permalink.